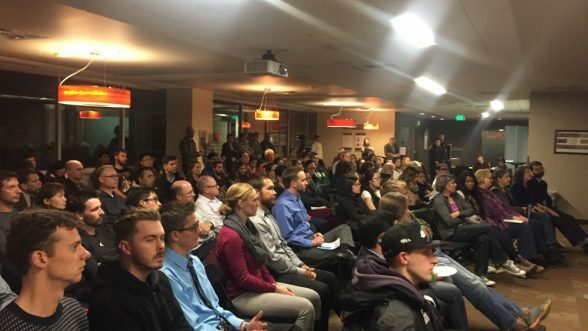 On November 30, 2016, University of Colorado Denver students learned about the very serious repercussions that come with financial fraud. 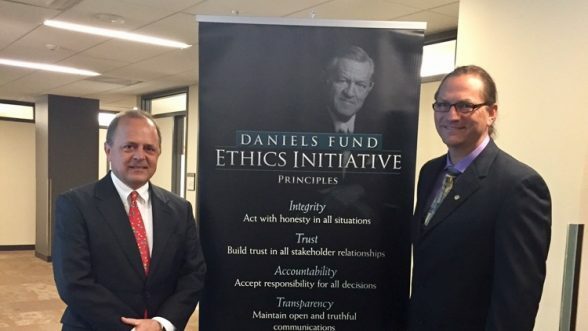 Nearly 130 students, faculty and alumni joined the Daniels Fund Ethics Initiative at the University of Colorado Denver Business School to hear the story of Weston Smith, former Chief Financial Officer (CFO) of the HealthSouth Corporation. On a cold night in December Weston Smith was wide awake—he just could not sleep. His mind raced, flooded with thoughts of what he’d become. He rolled over and glanced at the bars of his eight-by-ten-foot cell. His life came into focus. He’d committed securities fraud and was serving a 27-month sentence in Federal prison. But it wasn’t supposed to be like that. He’d worked his way up the corporate ladder and was eventually named CFO of a Fortune 500 company. He played the game—flew on the company’s private jets, bought expensive clothes, cars, and homes. He lived life according to HealthSouth’s infectious, materialistic corporate culture. “The culture was all about out-of-control, over-the-top living, in every way imaginable,” he said. But at the time things seemed fine. He was enjoying the success of his executive role. He did not realize that the nightmare was just beginning. From the start, HealthSouth was a model of business success…on paper. Soon the company expanded nation-wide. All signs pointed to success and growth. But internal pressure for positive earnings reports re-directed the company’s path. Smith explained that the fraud started out small. “It’s not like we walked into the office one day and said, hey let’s commit securities fraud!” he stated. But HealthSouth employees felt compelled to make rationalizations. They had to placate their demanding leader, CEO Richard Scrushy. Over time, small missteps snowballed into blatant financial statement fraud. The cover-up spiraled out of control. “At the height of the fraud we made over 126,000 false journal entries in one quarter alone,” Smith said. He saw no way out. If he blew the whistle, everyone would go down—not just the executives. Lower-level employees—people with kids, mortgages, sick spouses—they’d all be investigated. At best, they’d lose their jobs. At worst, they’d go to jail. The thought of shattering so many innocent lives was simply unimaginable to Weston Smith. In 2002, after Weston Smith was named CFO of HealthSouth, Congress passed the Sarbanes-Oxley Act, a law intended to protect investors from fraudulent accounting by corporations. Smith was distraught when he realized that Sarbanes-Oxley required him to take personal responsibility for all reported financial information. He could not sign off on HealthSouth’s fraudulent financials. Tired of the lies, Weston resigned. But Richard Scrushy, a charismatic, motivating leader, sweet-talked Weston into re-joining HealthSouth. He made promises of significant change. They would re-structure HealthSouth with Weston’s help. They’d get back to doing the right thing. But he still needed Weston’s signature on that pesky Sarbanes-Oxley disclosure. Weston bought into Scrushy’s promises. He felt confident that the company could straighten itself out. But a Sarbanes-Oxley mess was looming. And Scrushy saw it coming. “A CFO refuses to sign the Sarbanes-Oxley disclosure – that’s a major red flag,” Smith said. Around that same time, Scrushy sold millions in HealthSouth stock, knowing Sarbanes-Oxley would negatively impact share prices. “Law suits came flying in. Many innocent investors lost a lot of money that day,” Smith elaborated. No longer able to continue the deception, Smith quietly contacted an attorney and set a secret meeting with the FBI. He disclosed everything he knew about the massive, $2.7-billion-dollar fraud taking place within HealthSouth. The fallout was severe. In all, 17 HealthSouth employees were charged with securities fraud, and all 17 served time in Federal prison.